My most recent CSA box had a mix of red and gold beets, and the usual onions, garlic, chard, and squash, plus the first of the tomatoes and some red potatoes. The beets were pretty small, so I didn’t get very many greens. I found Mark Bittman’s Raw Beet Salad recipe and have been enjoying it all this week. It’s very easy to make, and quite a delicious. I didn’t grate my veggies as per the recipe. I just diced cuz I like to get out a big knife and whack veggies at the end of a long stressful workday. Uncooked beets are less sweet and earthy than they are when boiled or roasted. If you just can't resist cooking them, once they're shredded, they can be quickly sautéed in butter or oil. Remember the cute little flying saucer squash? They were so good just steamed whole for 3 minutes. If I get any more, I may get fancy and stuff them with something. Most of the zucchini and yellow squash have been made into stirfries, such as this one with mushrooms, onions, and daikon. Here’s a fun recipe I haven’t made, but it’s on my long list of recipes to make. Place the watermelon slice on a serving platter and cut into 6 wedges leaving them in the shape of a pizza. Spread the preserves over the watermelon and sprinkle the toppings over the top. Wow! Way to get creative with a watermelon. That looks delicious and entertaining to kids and adults alike. Now I am craving beets from your first picture! That watermelon thing is crazy! But I'm loving the beet salad! hahah that watermelon pizza makes me laugh! Mmm I love squash and beets! I'll deftinitely have to try that salad when the weather starts warming up again! Haha, that watermelon pizza is something else! I heart that watermelon pizza! I will have to show that to a friend of mine who has her niece and nephew flying over here for a summer vacation - they will LOVE it. I love your stirfry....with the Daikon! Nummmmy. The watermelon pizza looks really cute! And golden beets...I'd like to try them! Well, Diann, in spite of my general avoidance of beets, I'm tempted to try that recipe. You make them look so appealing even though they're ... beets. I think if I try it, I'll grate mine. oooh, thanks for reminding me about that beet salad, I've got a bunch of beets in the fridge. Thanks! 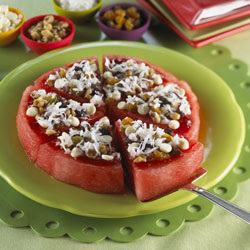 also, I love the watermelon pizza - cute! Mmm...I can't believe I hated beets up until last year! They're so tasty, especially the fresh, local ones! What a lovely salad! I'm still working on an appreciation for beets, but I think that this recipe may help. It certainly looks beautiful! the watermelon pizza is quite possibly the cutest thing I have seen today. And i've been wanting to do more with raw beets-leave it to Bittman! 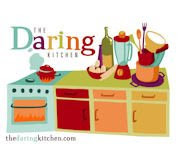 just found, and love, your blog!